The Estate Vineyard is located about 1 km from a small medieval village perched on a hill overlooking the whole valley of the river Cecina. 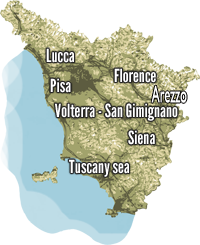 The estate is located in ‘area that comes from Volterra to the Tyrrhenian coast, totaling approximately 270 acres, 27 of them with vineyards. The Estate has been restored several farmhouses for farm activities. It ‘been paid great attention to architectural details: flooring tiles, roofing beams, wooden shutters and a simple and elegant furnishings with antiques. The apartments are different types and sizes but all have large green spaces to live in freedom the Tuscan countryside. The apartments, surrounded by nature, have a swimming pool overlooking a wide view of the valley. The winery can be visited on request and you can make tasting with samples of meats and cheeses. The pool is located in a panoramic position with a large solarium. Near the pool is the pine forest where you can spend pleasant afternoons playing bowls or just relaxing. The farm is particularly recommended for families for its wide open spaces and couples who want to visit the most famous Tuscan villages, easily reached from this area. The apartments vary in size, many of these are on the first floor or have the staircase. Everyone can enjoy the outdoor spaces.